~*~ Juz Mel: Part & Parcels of Life ~*~: Vote for Jasper to be the new face of Advocate Parasite Protection! Vote for Jasper to be the new face of Advocate Parasite Protection! Hi people, Advocate, Australia's No.1 Parasite and Flea protection is looking for a dog and cat to be the new face of their advertising campaign. So please help to vote for Jasper and make him the new face of Advocate! If we get anything we'll share it with everyone of you who clicked to vote! :) Go visit Jasper's page and click on the blue button to vote for him. Also click on Jasper's pictures tab and click on the "thumbs up" icon to vote for his photos. Every vote on every picture counts, so please try and vote for all. If you join as a member of the site, you can just easily vote but if you're a visitor, you'll need to enter the scrambled letters in the pop-up window and hit enter to vote. A bit of a hassle I know, so do it when you're free. Thank you! 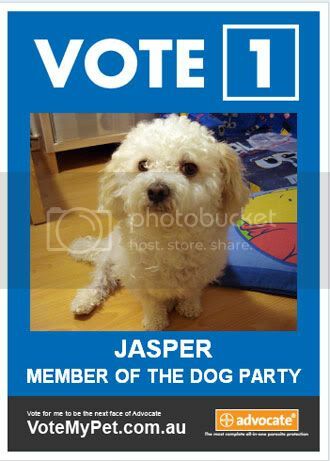 Click here to vote for Jasper! VOTE VOTE... I DID VOTE!!! Thank you very much Liliz! *Jasper gives a lick* How have u been lately? I will not agree on it. I think polite post. Specially the title attracted me to review the intact story.